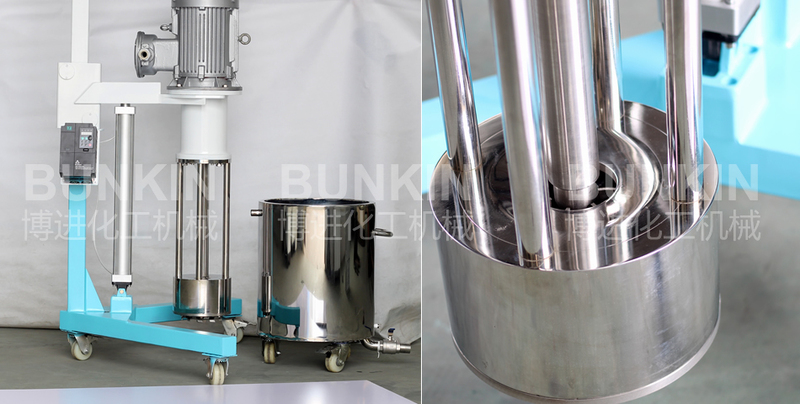 Basket Mill (pneumatic lifting)_Anhui Bunkin Chemical Machinery Co.,LTD. Application Industry: Suitable for emulsion paint, industrial paint, color paste, water-borne ink, fertilizer suspension, solvent based enamel etc. 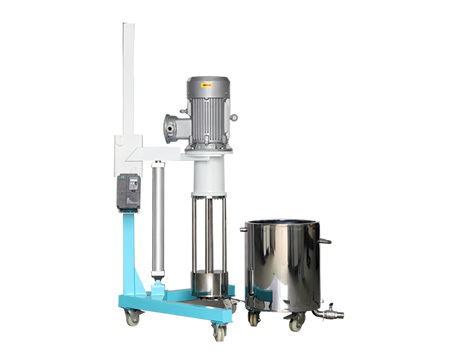 Basket Mill (Pneumatic Lift) integrates dispersing and grinding into one machine, suitable for grinding liquid materials with mid and low viscosity. Materials Viscosity: <=5000cps Production Capacity:30-300L Application Industry: Suitable for dispersing, grinding materials in industries such as biology, pharmacy, cosmetic, food, paint, ink, color paste, dyestuff, fertilizer etc. Applicable Materials: Materials shall be with viscosity less than 5000cps, with comparatively high requirements of final grinding result or with many varieties such as emulsion paint, industrial paint, color paste, water-borne ink, fertilizer suspension, enamel etc. A SS 304 shaft duly machined and balanced is provided. The shaft is installed in a bearing housing provided with taper roller bearings. Lubrication points are provided on the housing. The grinding basket is made from special steel to withstand high wear and tear. 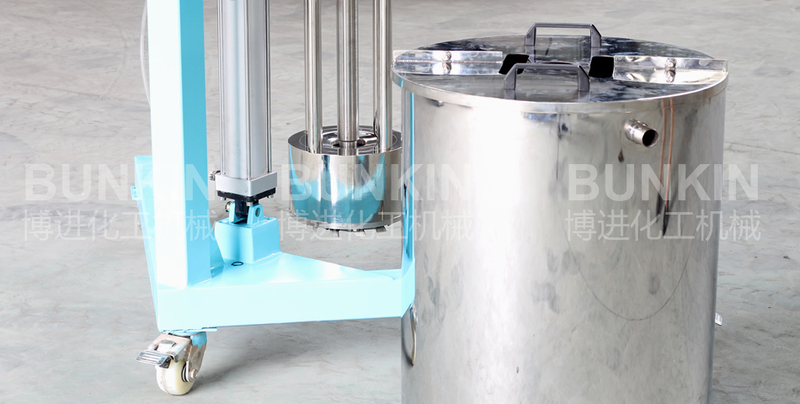 The double jacket cooling grinding basket is optional. The excellent grinding basket design makes good milling result, easy to clean and convenient to maintain the machine. The entire drive head and shaft is lifted and lowered by pneumatic lifting control system. The lift distance is based on the batch capacity. An AC Frequency inverter installed in a panel controls the RPM from 0-1750.depend on the viscosity. The inverter is provided with settings for monitoring torque, amperage, voltage, power factor etc. 0.8mm separated basket screen is supplied which makes to be used above 1.6-1.8mm ceramic zirconium beads in order to get good fineness result.